← Win Toys For Helping Tots with Geeks for Tots! Thought killed during the Asgardian Ragnarok, Thor and his people later return to Earth and recreate Asgard in the skies over Oklahoma. Along with his magical hammer Mjolnir, Thor resumes his fight against evil - including Loki. Thor's modern costume is more martial and less "superhero," with big scale mail armor covering his arms and legs. The paint is only on the outsides of his arms, which is always annoying. The bootfronts are new, as is the giant chest cap, which gives us his cape and tunic all in one. They really went overboard in sculpting his shirt. The thing's got tiny wrinkles, for cryin' out loud! His face is a decent size this time, but either it's painted too low on the head, or the helmet doesn't come down far enough. He's also got a waist extender to make him taller, but it's too much. It's like they designed his chest and then realized it would come down too far over the legs, and this was the easiest way to fix it. Mjolnir is a new mold, too. The devilishly manipulative Loki emerged from Ragnarok looking rather different, having taken a new female form. Despite claims to the contrary, Loki continues to sow chaos and mistrust whenever possible. As that bio tells you, this isn't just some floozy who patterned herself after Loki: this floozy is Loki! Sure, in mythology he changed genders like you change socks, but in the comic everyone reacted like it was some crazy thing. 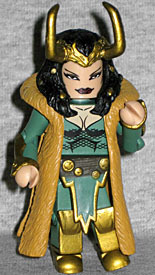 This is a top-notch Minimate, though: the fur cape, forearm decorations, loincloth and bootfronts are all sculpted pieces - as is her hair, of course! The big hooked horns are now part of a crown, rather than a helmet, and she has beads woven into her hair. There's a delightful smirk on her face, and the forehead is as big as Coipel always drew it. I honestly didn't think much of this Minimate until I actually started playing with it, but she is pretty swank. 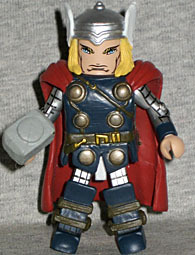 This entry was posted in Art Asylum, Marvel, MMMR and tagged Minimates, Thor. Bookmark the permalink. I guess he's been... reThorn.